Saraki Replies Buhari's Loyal Senator, Adamu: "You're Attacking Me To Save Yourself From EFCC"
Saraki was reacting to the claim by Adamu that he (Saraki) once referred to Senator Dino Melaye as a clown in a private chat with him (Adamu). The Senate President, in a statement issued on his behalf by his Special Adviser on Media and Publicity, Yusuph Olaniyonu, alleged that Adamu had been peddling insults and lies against him but he had ignored him out of respect for his age. 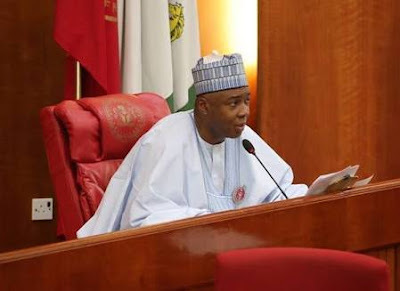 Saraki said, “I have deliberately ignored the antics of Senator Abdullahi Adamu, especially his constant media attacks on me and the Senate since the Economic and Financial Crimes Commission (EFCC) dusted his file on alleged case of corruption and also went ahead to arraign his son in court. “So far, I had refrained from responding in kind out of respect for his age. However, it seems he has misread my maturity and respect for docility. He feels the best way to play his self-survival game and ingratiate himself to the government in order to save his skin is for him to be seen to be fighting Saraki, even if that would require him to tell brazen lies and peddle mischief in his old age. Saraki said it was clear that Adamu’s seven years could not be compared to Melaye’s three years in the Senate. “Senator Adamu is free to challenge this assertion by showing his records,” the Senate President said.